Validity of ASL Resources - SignOn - Connect. Practice. Retain. Check to see if a sign is similar across various resources, i.e. dictionaries and ASL books. There will be some variations due to regional signs, but the common signs such as “please” and “thank you” are pretty standard. 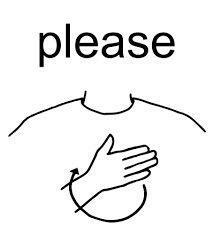 The sign for “Please” is a flat hand circling the middle of the chest – but there’s a YouTuber incorrectly “teaching” the sign up on her shoulder. Explore the resource thoroughly. Are they “deaf-friendly”? This means that the site actually supports and understands Deafness and Deaf Culture. Make sure the vocabulary lists used are current and up-to-date on proper terminology and words used these days. ASL is a very fluid and changing with the times, such as the new sign for “phone” is now a C-shape as if holding a cell phone – as opposed to the Y-shape of the older phone receivers. There’s one popular GIF site that still teaches the sign for “Mentally Retarded” instead of Developmentally Delayed or Intelligence Delay. Is there anyone on the site or page that is Deaf themselves? If it is all “hearing”-managed without any Deaf involvement or Deaf members – you need to question why that is? The Deaf community is so diverse in personalities and types that they’ll have various interests and participate in different activities, so if there’s an “ASL” or “Deaf” site without any Deaf involvement, that’s a big red flag. Don’t be afraid to ask for a reliable resource for Sign Language. Everyone here at SignOn will be glad to recommend some to you to continue your positive learning experience.